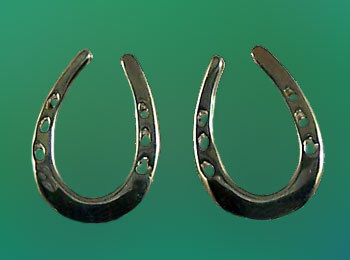 "Saddlebred Horseshoe Earrings in Sterling Silver"
Horseshoes designed for the American Saddlebred offered in earrings. 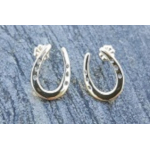 The Gorgeous Horse your source for Saddlebred jewelry. This is just like the shoes used on Saddlebred horses! Offering great detail compared to that of an actual real toe weighted shoe. 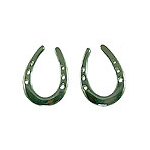 There is a lot of horse shoe designs out and about, but you can only get the real thing from The Gorgeous Horse. We know this from experience because we are at your show's quite often and understand the difference in your gear compared to the many other breeds. So this one is all for you guys in the Saddlebred world.